They’re back on track. 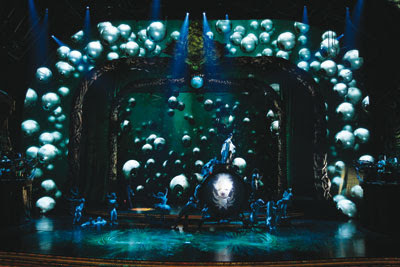 Cirque du Soleil opened its newest creation, Zarkana, last night at Radio City Music Hall and it’s a return to the traditional spectacle of color, lights, movement and song that has produced so many vivid and exciting productions playing across the country and worldwide. (The last production New Yorkers saw was the ill-fated Banana Shpeel, a vaudeville-style deviation that didn’t work). Under the skillful creative leadership of Francois Girard, an opera and film director (“The Red Violin,” “Silk”) who also crated Cirque’s Toronto production Zed, Zarkana is a beautiful journey, perhaps more cohesive, and with lyrics that can be understood (not always a given in these shows) than any other Cirque production I have seen. The show’s title is a fusion of the words “bizarre” and “arcana” (meaning “mystery” or “secret”) and represents the twisted fictional world of Zarkana, an elusive destination that is fantastic yet bizarre. The story follows magician Zark (I can’t find a credit for the actors), dramatically outfitted in a red-and-black costume (Alan Hranitelj designs the multitudes of colorful costumes blending with and contrasting from the setting) who loses his love and assistant, Zia, along with his powers. He returns to an abandoned theater where he once was successful to try to find them. There he encounters numerous characters including two clowns, four “Mutant Ladies,” The Pickled Lady, Mandragora, Kundalini and Tarantula, who try to seduce Zark, as well as a variety of acrobats, balancers and high wire performers. Girard expertly directs, so that the circus acts, including trapeze, the wheel of death, hand balancing, a flag throwing number and even a sand-art presentation by an Oracle, blend with the story. He also keeps all of the action focused and everyone on stage seems connected (there are some 75 artists involved). Playing a role themselves, are Stephanie Roy’s breathtaking sets, anchored by three arches on the massive Radio City Music Hall stage, where large pieces of equipment or blooming flowers simply vanish or appear through the stage floor (Roy also designs the props). Each set change looks like a work of art. The color blends and details are meticulous and highlighted by Alain Lortie’s lighting design. There’s a great spider web for Tarantula making us wonder why Spider-man Turn Off the Dark didn’t just used something like this and save themselves a lot of injuries. Video projections on a 90-by-40-foot LED arch add even more depth. The Picked Lady is a kind of creepy multi-limbed baby in a jar and more than 150 snakes writhing around Kundalini’s fiery pit arch are almost a bit too realistic…. Nick Littlemore composes and directs a score that is somewhere between blues and soul with Zark sounding like a soulful Elvis (though Girard himself classifies the work as a rock opera). The band is housed in two 28-foot tall, 9,000-pound-plus “eagle-head bandstands” raised stage left and right. Debra Brown and Jean-Jacques Pillet choreograph. Florence Pot is the acrobatic performance designer. Line Tremblay is the director of creation. The two-and-a-half-hour production is fast moving and satisfying. It includes a 20-minute intermission. Little kids at the performance I attended seemed engrossed. From a Christian perspective, though the story plot involves a magician, an oracle and seduction, I would venture to say that like most Cirque shows, the plot gets lost in the spectacle. If you hadn’t read the details here, it’s very likely you wouldn’t follow them during the show with all of the visual stimulation and interesting circus acts. I didn’t note any objectionable parts. Zarkana runs through Oct. 8 at Radio City Music Hall, 1260 Avenue of the Americas (6th Avenue), NYC. Tickets range from $47 to $130 with a limited number of premium tickets available. For tickets, go to www.cirquedusoleil.com/zarkana or call 866-858-0008. Tuesdays through Fridays at 8 pm; Saturdays at 2 pm and 8 pm; Sundays at 2 pm and 7 pm. Wednesday matinees at 2 pm begin July 13. From a group of 20 street performers at its beginnings in 1984, Cirque du Soleil is now a major Quebec-based organization providing high-quality artistic entertainment. The company has 5,000 employees, including more than 1,500 performing artists from close to 50 different countries. For more information, visit http://www.cirquedusoleil.com/. 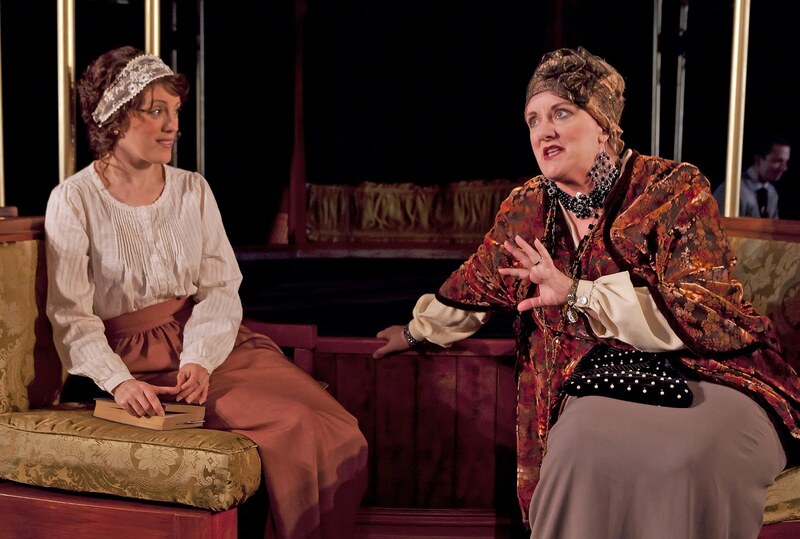 Mary Theresa Archbold (Ginger), Anita Hollander (Rose) and Tiffan Borelli (Gorgeous) in Bekah Brunstetter's GORGEOUS, part of Theater Breaking Through Barriers' SOME OF OUR PARTS at the Clurman Theatre (410 West 42nd Street). Photo by Carol Rosegg. Seven plays looking at life with disability, linked by Kate Moira Ryan's "Casting Call" sketch where TBTB members try and fail to get members of their company cast in productions of plays featuring characters with disabilities. Seems most shows would rather cast actors without disabilities to play disabled characters, even if an actor with the same kind of disability is available. The presentation includes the world premiere of LaBute's short "Cripples," directed by Ike Schambelan, TBTB artistic director and founder. able-bodied actors with artists with disabilities isn't afraid to delve into subject matter that might be considered tabu. Most of the short sketches provide thoughtful insight into what it is like to live with, or be affected by someone who has a disability. Funny, truthful and moving, in particular, are the linking phone calls where other production companies give a long list of reasons why they won't even let a disabled actor read for a part. We know, unfortunately, these have to be based on real conversations. Most of the sketches are realistic as well (with the exception of "The Big Payback" by Tabnick, which meanders into the macabre and deals with a different kind of disability). Particularly good are "Blind Date" by Diane Son, directed by Kimothy Cruse) in which Walter (a very good Aiden Fulcomer) hides his disability from online-dating match Sarah (Pamela Sabaugh) and "Gorgeous" by Bekah Brunstetter, directed by Christina Roussos, where disabled Ginger (Mary Theresa Archbold) and Rose (Anita Hollander) discover that they might be a lot better adjusted than the weight-and-beauty-obsessed gorgeous woman (Tiffan Birelli) they feel intimidated by in their gym locker room. Lots of language. Far more than seems proportional for the 75-minute show. "Welcome to Walmart" by Samuel D. Hunter includes lot of good insight, but seems a dig at the department store chain as much as a statement about difficulties encountered by disabled folks in the workplace. LaBute's "Cripples" explores the idea of three older men becoming emotional cripples, but seems to exploit the details of one's sexual encounter with a woman with no legs for uncomfortable laughs. Some of Our Parts plays through June 30 at the Clurman Theatre, 410 West 42nd St., NYC. Performances are Tuesday, Wednesday and Thursday at 7 pm; Friday at 8 pm; Saturday at 3 pm and 8 pm; Sunday at 3 pm. For information and tickets, visit http://www.tbtb.org/. Theater Breaking Through Barriers, formerly Theater by the Blind, was founded in 1979. The company's mission is to change the image of people with disabilities from one of dependence to independence, to fight stereotypes and misperceptions associated with disability, and to show how vibrant, fluid and exuberant the work of artists with disabilities can be. 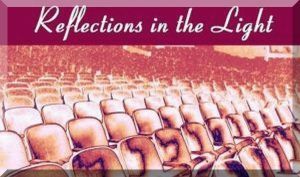 Playwright David Davalos and journalist Retta Blaney have been named recipients of 2011 “The Lights are Bright on Broadway” Awards presented annually by Masterwork Productions, Inc. to individuals and organizations making a difference in the Broadway community through faith. Davalos is being honored for his play Wittenberg, a witty battle of wills and philosophies between Dr. Faustus and Martin Luther as they attempt to influence star pupil Hamlet at 16th-century Wittenberg University. 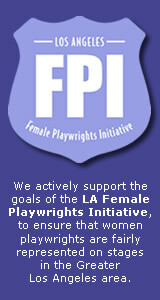 The play was presented March 11 - April 17 by Off-Broadway’s Pearl Theatre Company. It also received the 2008 Barrymore Award for Outstanding New Play and will have its London debut at the Gate Theatre this September. 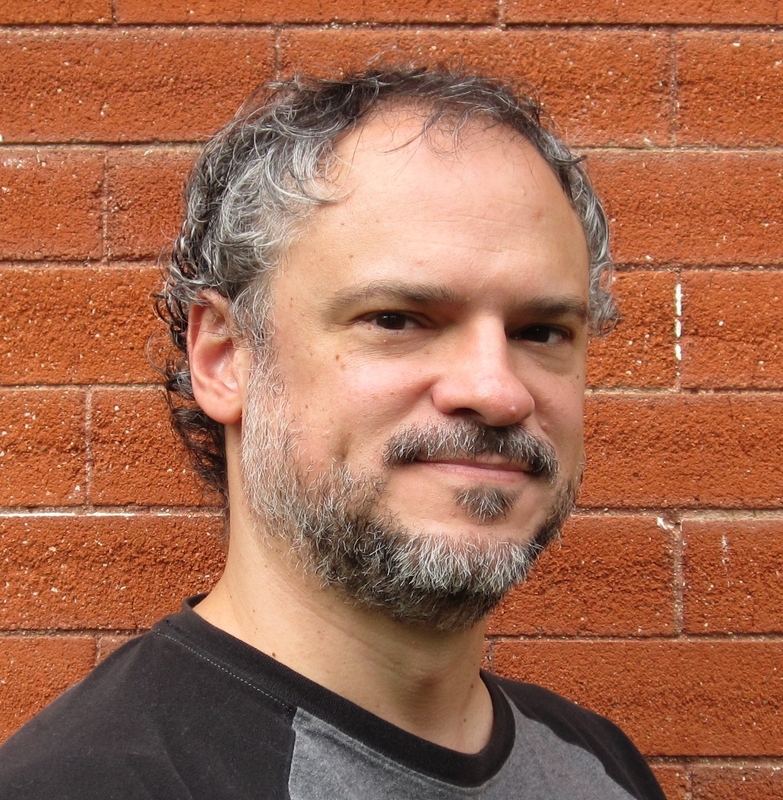 Davalos also is the recipient of the National Theatre Conference’s 2008 Stavis Playwriting Award. He is a graduate of the theatre programs of both the University of Texas and Ohio University. Some of his other plays include Daedalus: A Fantasia of Leonardo da Vinci; The Tragedie of Johnnius Caerson (a comedy in blank verse chronicling the Late Night TV Wars) and Darkfall (a modern sequel to Paradise Lost). 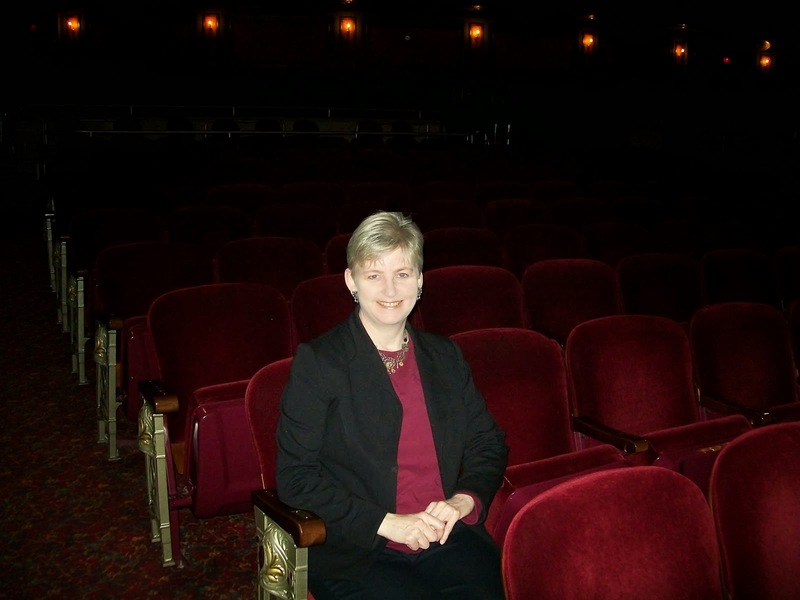 ﻿ ﻿ Blaney is a journalist and theater critic and writes Life Upon the Sacred Stage, a popular blog about theater and faith. She is the author of "Working on the Inside: The Spiritual Life through the Eyes of Actors," featuring interviews with Kristin Chenoweth, Edward Herrmann, Liam Neeson, Phylicia Rashad, Vanessa Williams and many other Broadway actors discussing their faith as well as "Stories from the Real World” with a forward by Walter Cronkite. 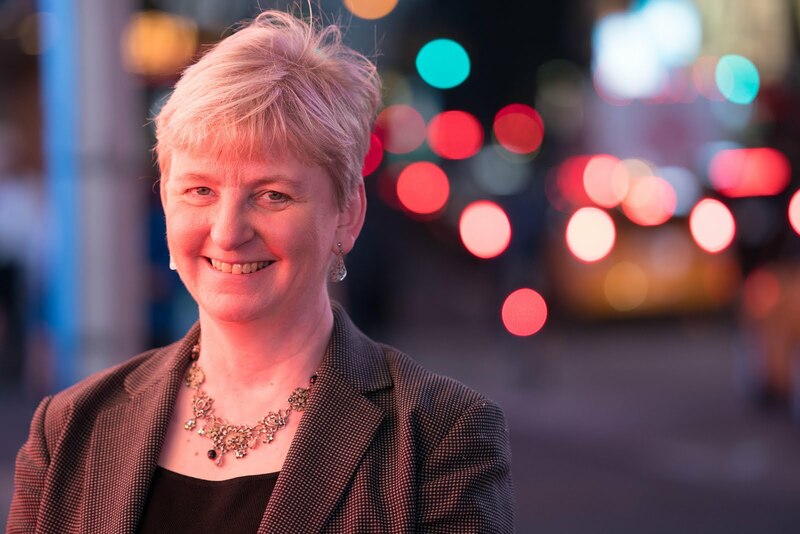 She also directs the annual Broadway Blessing, a free interfaith service at St. John the Divine Cathedral, which brings together the Broadway community each September to ask a blessing on the new season. Her award will be presented at this year’s service 7 pm Monday, Sept. 12. Among the performers who have taken part in the service over the years are Lynn Redgrave, Marian Seldes, Frances Sternhagen, Boyd Gaines and Edward Herrmann. 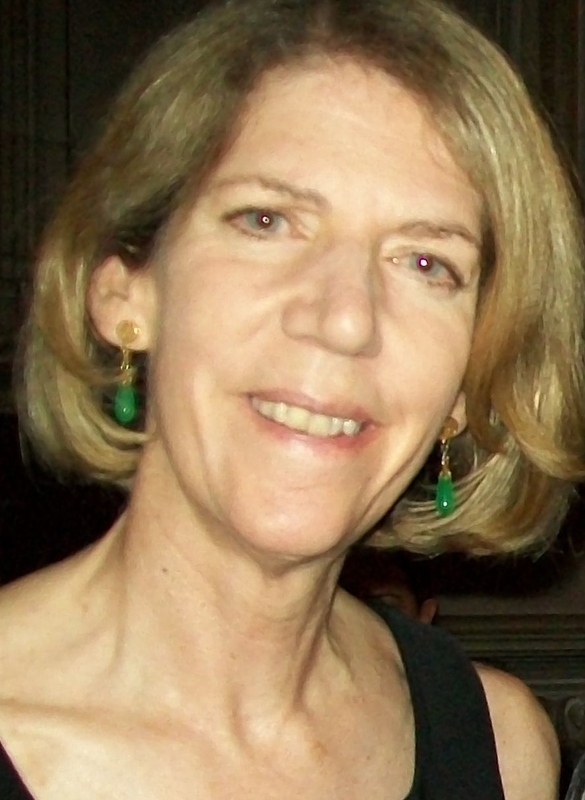 Previous recipients of “The Lights are Bright on Broadway” Awards are Kia Corthron for her play A Cool Dip in the Barren Saharan Crick (Playwrights Horizons), Max McLean for The Screwtape Letters (Westside Theatre), Dan Gordon for his play Irena's Vow on Broadway and Radio City Rockette Cheryl Cutlip, founder of Project Dance. Masterwork Productions, Inc. is a faith based, non-profit performing arts organization, which among other services, provides the only resource for professional Broadway and Off-Broadway theater reviews with an added Christian perspective. 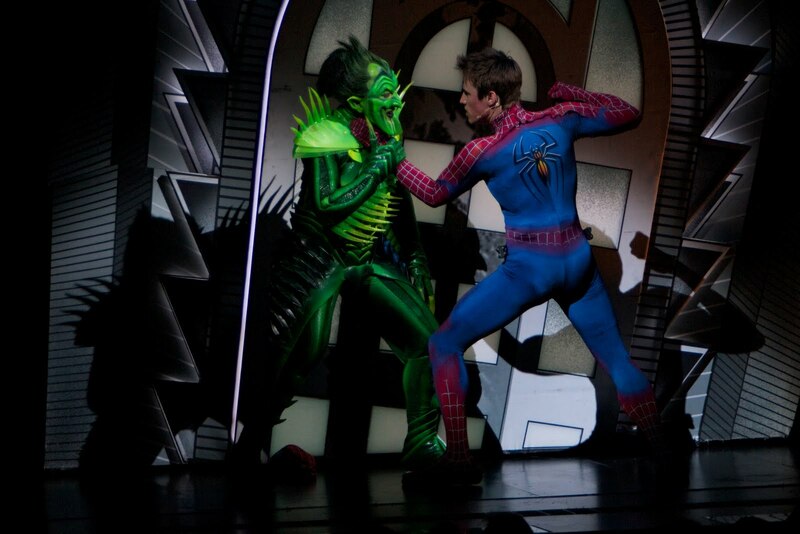 In the comic-book-inspired Broadway musical Spider-man Turn Off the Dark, the super hero beats back bullies, vanquishes villains and gets the girl, but in real life, he comes back from the dead. The $75-million show, long beset by production problems, injuries and inquiries about safety postponed its opening, first scheduled for last November, multiple times before shutting down. What finally did Spidey in was a slew of horribly negative reviews filed by New York critics who broke with tradition and wrote about the show before its official opening. After all, they reasoned, audiences had been paying full price for shows for months and an official opening might not happen if financial woes or safety issues shut down the production. In April, producers put the show on a three-week hiatus while shaking up the creative team. Director Julie Taymor, who had collaborated with Bono and The Edge (the rock group U2), who wrote the music and lyrics, as well as co-wrote the book with Glen Berger, left the show. Philip William McKinley was brought in as creative consultant, along with book writer Roberto Aguirre-Sacasa (a playwright and writer of Spider-Man comic books) and choreographer Chase Brock (Daniel Ezralow did the original choreography and aerial choreography). Previews on what has been dubbed “Spidey 2.0” began May 12 and the show finally opened last Tuesday. I had attended a preview and had been skeptical that anyone, even a super hero, could save the woefully bad show, especially with only three weeks to vanquish the villains of an incomprehensible book and a surprisingly bad score. But “Pow!,” “Zap!” Some major edits have resulted in a decent, if not excellent, production that provides a visually stunning flying spectacle that’s absolutely worth seeing. Scaled back is the overpowering storyline that had Arachne (T.V. Carpio), the spirit of an ancient Greek weaver who angers the Gods and is turned into a spider who tries to seduce and control Spider-man (Reeve Carney) when she isn’t out shopping for shoes (I’m not kidding. As I said, incomprehensible). Also edited are content issues that had me pausing about whether I could recommend the show for younger audience members. In this version, Arachne is a sort of helpful fairy godmother who encourages Peter Parker as he makes the journey from nerdy and oft-bullied high school nerd into a super hero. Meanwhile, schoolmate Mary Jane Watson (Jennifer Damiano), who lives next door to Peter, his Aunt May (Isabel Keating) and Uncle Ben (Ken Marks), hopes a career on stage will take her away from life with a drunken father. When Peter Parker is bitten by a genetically mutated spider on a school field trip to the research lab of Norman Osborn (Patrick Page) and his wife, Emily (Laura Beth wells), nothing is the same. Peter suddenly is shooting web from his wrists, walking on the ceiling and taking care of the school bullies, Flash, Kong, Meeks and Boyle (Matt Caplan, Luther Creek, Christopher W. Tierney, Dwayne Clark and Ken Marks). At first seduced by trying to use his super powers for profit, Peter opts instead to heed his uncle’s advice that “with great power comes great responsibility” and starts fighting crime in New York City. He and Mary Jane start a relationship, but she doesn’t know about his alternate identity and feels neglected by his frequent absences to foil the bad guys, which he disguises as following the super hero to take photos for the newspaper. When Osborn uses his genetic experiments on himself, he is transformed into a pumpkin-bomb-throwing Green Goblin, who unleashes the “Sinister Six,” -- Carnage, Electro, Kraven the Hunter, The Lizard, Swarm and Swiss Miss (Collin Baja, Emmanuel Brown, Christopher W. Tierney, Brandon Rubendall, Gerald Avery, Sean Samuels) a mutant squad of villains on New York City and on Spider-man, who fears for Mary Jane’s safety should the Goblin learn his true identity. Page hams up his role and deservedly gets most of the show’s laughs. But enough of the story – let’s talk about effects. An aerial encounter between Arachne and Peter is quite nice (though the spider has to abandon her extra legs to accomplish it). The flying confrontation between Spider-man and the Goblin above the Chrysler Building, with its breath-taking perspective as created by the colossal sets (George Tsypin, set design; Donald Holder, lighting; Kyle Cooper, projection; Scott Rangers, aerial design) is amazing. Loved the tiny little taxis making their way on the streets below. Huge video screens fragment and rotate and in some scenes, animation is used to graphically illustrate the backdrop and at times, give the impression that the story is unfolding within the pages of a comic book. Completing the visual odyssey are masks, prosthetics, puppetry and multiple costumes (Eiko Ishioko, design). Spider-men fly and leap from the stage up into the balcony or into the house. It’s certainly the highlight of the show, and it’s too bad there isn’t more, because let’s face it, besides Spider-man’s brand name, the biggest draw this show has with the audience is the flying. While the book is much improved (elements that were lost before now make sense), and sticks pretty close to the comic book story, there still are a few places for edits. In particular, the time frame seems fractured. At one point we appear to be in the hey day of newspapers with old-fashioned flash cameras, fedora-wearing newsmen and black enamel phones with the receiver cradled on top. In the next beat, editor J. Jonah Jameson (Michael Mulhearn) is talking about the internet and Homeland Security and Osborn is wearing a jacket designed with computer circuitry. The music still isn’t quite what we would expect from a Broadway score either. The revised version sounds less repetitive and a few songs have some nice parts (there are a couple of nice ballads and Carney and Damiano do them justice). For the most part, however, the tunes aren’t memorable and are more of a driving beat to which scene-moving lyrics are attached than melodic songs (though there are reports that the duo will continue to work on the music even now). Snippets of U2 tunes are inserted for music at the high school dance and while the Goblin is on hold while placing a phone call (credit for that knowledge goes to my younger, hipper and U2-savvy daughter). So is Spider-man Turn Off the Dark the best musical I have ever seen? No. Is it a musical worth seeing? Yes (and if you are a fan of Cirque du Soleil, this should be right up your alley). Now that it is open, catch it at the Foxwoods Theatre (retooled specifically for this show) at 213 West 42nd St., NYC. Discounted tickets are available by clicking here. Austin Wiggin (Peter Friedman) believes the predictions his now-dead mother once read in his palm: that he﻿ would marry a redhead, live in a yellow house and that his girls will save him and bring him into the light. The first two predictions have come true. He and his wife, Annie (Annie Golden) live in the yellow house in Fremont, NH where times are tough. Austin just got turned down for a promotion at the mill and even can't score any overtime to help make ends meet. Suddenly, in 1969 the answer comes to him. His girls, Dot (Jamey Hood), Betty (Sarah Sokolovic) and Helen (Emily Walton) will become a famous rock band and fulfill the last part of the prophecy. That they have no singing talent doesn't seem to be an issue for Austin, who becomes almost maniacal in his pursuit of the goal. He borrows against the house, withdraws the girls from school, buys Helen a drum set for her birthday with electric guitars for the others, and orders their mother to homeschool them so they can spend most of their time practicing. The girls are rather unenthusiastic about the prospect, but Dot defends her father (in the poignant "Don't Say Nothing Bad About Mr Dad"). Especially unhappy is Betty, forced to sneak out of her bedroom window for secret romantic rendezvous with Communist wannabe Kyle (Cory Michael Smith), whom she secretly marries, but doesn't mention to her father. There is a subtle, unvoiced fear of their father that urges the girls to comply and continue their weekly concerts at the Fremont Town Hall where a record producer (Kevin Cahoon) spots them and promotes their one horrible album "Philosophy of the world" into rock history (this is based on a true story, believe it or not). The show features tight direction with a good book and insightful lyrics. It's more about the girls trying to figure out who they are and what they want from life and how their father factors into both of those questions than it is about the history of a rock group. The music varies from kind of punky, to ballad. The scene where the promoter and technician record this horrible album and the audience gets to hear what they hear (it's awful) along side what the father is hearing (it's wonderful) is a real treat (Darron L. West Sound). The set (Mimi Leon) and costumes (Emily Renholz) embody the tragedy of the story. Steve Routman expertly rounds out the cast in a number of roles, most notably a very funny high school principal. The choreography is neat too. At first I questioned the wisdom of casting Friedman's less than star-quality vocals as a lead singer, but after a while he grew on me. In the end, it makes perfect sense that the father who appears tone deaf where the girls are concerned wouldn't be a Broadway tenor himself. So hang in there with him. he does a wonderful job of bringing out the empty soul of this guy. 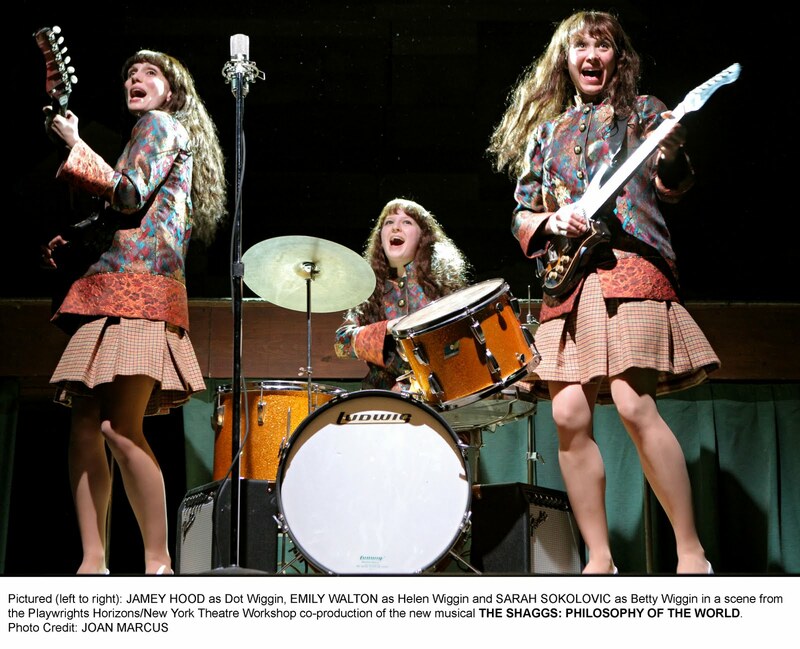 The Shaggs Philosophy of the World plays Off-Broadway through July 3 at Playwrights Horizons Mainstage Theater, 416 West 42nd St., NY. The performance schedule: Tuesdays at 7, Wednesdays through Fridays at 8, Saturdays at 2:30 and 8 and Sundays at 2:30 and 7:30. For tickets, visit http://www.ticketcentral.com/, call 212-279-4200 or visit the box office, 416 West 42nd St. (between 9th and 10th avenues). By Tony Kushner, adaped from Pierre Corneille's "L'Illusion Comique"
Pridamant of Avignon (David Margulies) would like to reconnect with his estranged son Calisto/Clindor/Theogenes (Finn Wittrock), so he enlists the help of a sort-of sorceress, Alcandre (an utterly delightful Lois Smith) and her hapless piano-playing slave, Amanuensis (Henry Stram) . With her magic, Primadant is able to view his son's life -- or several versions of his life -- which involve falling in love with Melibea/Isabelle/Hippolyta (Amanda Quaid), whose father wants her to marry someone else like the cruel, but socially lofty Pleribo/Adraste/Prince Florilame (Sean Dugan) or the older living caricature of a fool Matamore (Peter Bartless). Reluctantly aiding her mistress in her quest for true love is the heroine's maid, Elicia/Lyse/Clarina (Merritt Weaver) who is in love with Pridamant's son herself. The design team (Christine Jones, set; Kevin Adams, lighting; Bray Poor, sound; Nilco Muhly, music) creates an ethereal atmosphere. We are whisked from Alcandre's cave, with it's dripping water, to a garden created with nothing more than a plastic plant and some cable lines. The full visual settings created by minimal lines and props are enhanced by Designer Susan Hilferty's 17th-century costumes. Don't take your eyes off of Smith as she and Margulies linger just on the edges of the action. Her reactions and facial expressions communicate reams through the silence and distance. There are some hard-hitting questions underneath the fairytale-like setting, like "What does love mean and what does it look like?" and "How do you measure the importance of a father?" and how are those two questions related? A little confusing at first. The Illusion is the third Kushner play this season at the Off-Broadway Signature Theatre Company, 555 West 42nd St., NYC. It runs through July 17. For tickets visit http://www.signaturetheatre.org/. winning Best Musical, Score, Book, Direction and other awards. War Horse won Best Play. The full list of winners follows. Click ont he title to see the review. 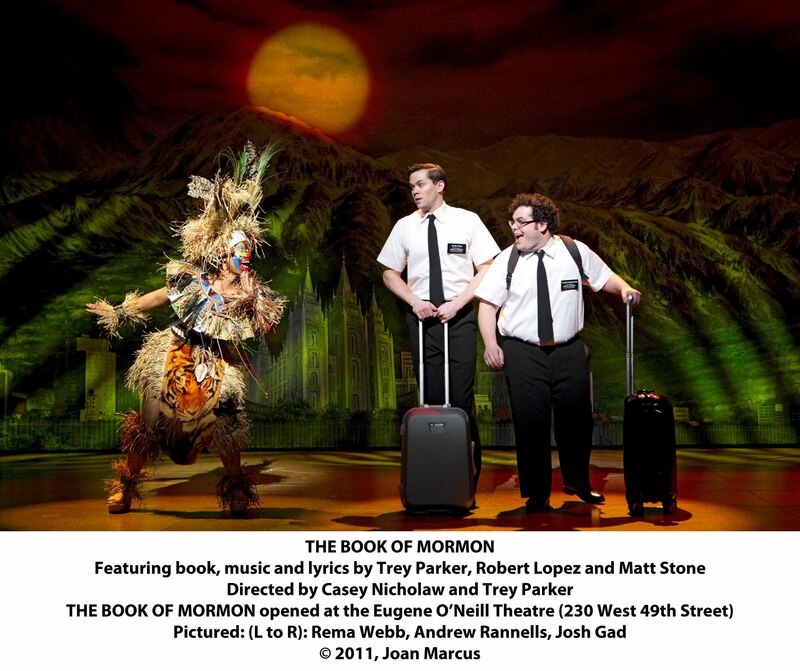 Click here to see whether we offer discounted tickets for a show. Winners in each category are bold italic. The Mint Theater Company continues to revive long-lost gems in its intimate Off-Broadway site and Rachel Crothers’ A Little Journey is no exception. This play from one of America’s most prolific early 20th-century playwrights (30 of her plays opened on Broadway between 1906 and 1937) was a nominee for the first Pulitzer Prize for Drama in 1918. Set in 1914, it follows the interactions of travelers in a first-class Pullman train sleeper car, in which the first two acts take place – no easy production task, even in 2011. The design team is up to the challenge, however, as lighting and sound (Paul Whitaker and Jane Shaw) enhance a carousel-like car design (Roger Hanna) which rotates periodically to simulate the motion of the train and gives Director Jackson Gay nice angles to plot the action. One moment, a couple in conversation arrive in their berth front and center; the next, a group of eavesdroppers in another part of the train laugh across the void. It’s all very clever. The story revolves (no pun intended) around society girl Julie Rutherford (Samantha Soule), who finds herself destitute and put out by the aunt who has raised her. She refuses the hand of suitor Alfred Bemis (John Wernke) because he doesn’t provide enough of an income, or true love, and in despair, she heads to her estranged brother in Montana aboard the train. (In a tip of the hat to old fashioned plays written before money was such an issue for a production and doubling of actors’ roles became more common, Wernke and two actresses playing society friends of Julie’s are in the play for only a few minutes of the first act and are not seen again). Free-spirited Jim West (McCaleb Burnett), headed home to Montana, pays for uptight Julie’s ticket when hers turns up lost, and a train-board friendship develops over four days. Keeping tabs on them are the other passengers: the pompous and demanding Mrs. Welch (Laurie Birmingham, who enjoys getting into the humorous part); young Lily (Chet Siegal) who is traveling with her near-deaf grandmother Mrs. Bay (Rosemary Prinz – some will remember her as Penny on the soap “As the World Turns”), two college students, Frank and Charles (Ben Hollandsworth and Ben Roberts); pants salesman Leo Stern (Craig Wroe), rich and pompous Mr. Smith (Douglas Rees), who gives Mrs. Welch a run for her money in the most demanding competition; Annie (Jennifer Blood), traveling alone and trying to care for her infant; and finally the porter (Anthony L. Gaskins), who takes care of all their needs. 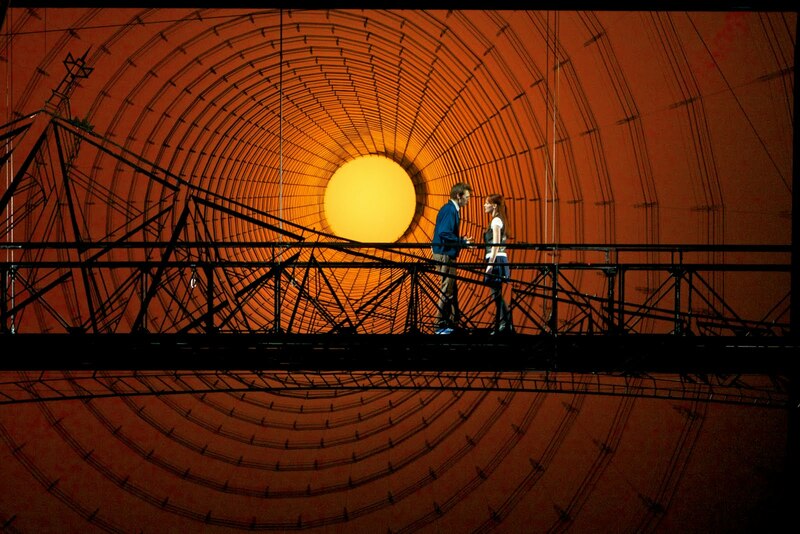 (Rees does the only doubling in the cast, also playing the conductor). The trip takes an unexpected turn (again, no pun intended) and the folks find that a new outlook and a journey of character may take them to a new destination in life. Some parts of the third act seem a little disjointed and the whole feels a little dated (though Martha Hally’s period costumes keep us tuned in to the era), but overall, A Little Journey is charming and holds up well over the years (it apparently hasn't been seen on stage since the 1930s following a 1927 silent film version which has been lost). Crothers apparently called the piece as a comedy, and while it probably wouldn’t be classified as such by modern standards, there is a lot of good humor in this play. A Little Journey runs at the Mint, Third Floor of 311 West 43rd St., NYC, through July 10. Tickets are $55. All performances will take place on the Third Floor of 311 West 43rd Street. Tickets are available by calling the Mint box office at 212/315-0231 or go to http://www.minttheater.org/. Give two playwrights an empty stage, two actors and a challenge to write a one-act on the theme of faith and what you get is a GraceNotes production of At the Corner of Reason playing at the Cherry Lane’s Studio Theater. The refreshingly quick 50-minute program offers two plays, Parent Teacher by Sharyn Rothstein, directed by Kel Haney, and Dissonance by Craig Pospisil, directed by Jim Eliot. Parent Teacher is a clash of cultures explored through intriguing dialogue between a Muslim teacher and the mother of one of her students. Teacher Rena Ayoubi (Suzanne Barbetta) is concerned about her student Cory’s lack of focus and preoccupation with flirting while wearing less-then-modest clothing. Her single working mother Keisha Daniels (Cherelle Cargill) feels the outfits are an expression of her daughter’s freedom and creativity and resents interference by the hijab-wearing teacher. The conversation gets personal – and very interesting – as the women ask questions and try to explain why they believe what they do. Wearing the hijab to cover her hair is an act she does every day for God and for herself, Rena says. She challenges Rena to try it on. She refuses, but finally acquiesces. She tells Rena that to Cory, wearing the hijab and long sleeves and a long skirt teaches her daughter something subtly every day – that her teacher thinks she needs to be covered up because she’s a woman. She counters by challenging Rena to teach without it. At first she refuses, then acquiesces (probably unrealistically). The dialogue is sharp and tight and is a lesson in how to relate to folks whose faith is different. The second play, Dissonance, sees Tricia (Deborah Jean Morgan) interrupts preparations being made by funeral home employee Fitz (William Peden) for her mother’s memorial service. Tricia hadn’t spent a lot of time toward the end with the mother who had forgotten her through Alzheimer’s, but Fitz found comfort in regular visits with his former piano teacher after a nerve disorder destroyed the feeling in his hands and his career as a concert pianist. 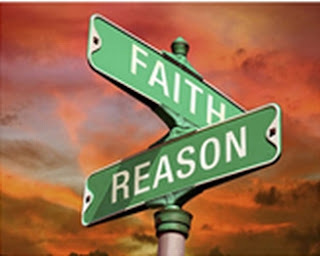 This play really has nothing to do with faith, but lands more on the “reason” side as the characters explore motive through their dialogue. The two plays are running in repertory with 3Graces’ production of As it is in Heaven through June 11 Tickets are $18 and are now available online at www.telecharge.com or by calling 212-239-6200. Tickets may also be purchased in-person at the theater box office one half hour prior to performance. Three siblings, their mates and their aunt gather for a dysfunctional family gathering where trying to cope with the choices they all have made interfere with another decision they now must make: is it OK for their father to commit suicide? Welcome to Tony Kushner’s newest play, The Intelligent Homosexual’s Guide to Capitalism and Socialism with a Key to the Scriptures, running off Broadway at the Public Theatre, co-produced in New York with Signature Theatre Company, which also presented Kushner’s Pulitzer-Prize-winning Angels in America and the currently running The Illusion for its 2010-2011 season. The family gathering is called when longshoreman Gus Marcantonio (Michael Christofer), observing in himself symptoms of the Alzheimer’s that has run in his family, decides to end his life before the union organizer and long-time former Communist Party member loses control. In truth, the patriarch lets it slip from time to time that the real reason for his surrender may be a loss of faith that anything ever really changes, not a fear of memory loss. A previous attempt to slit his wrists failed and caused his family a lot of anguish, especially youngest son V (Steven Pasquale), a contractor, who ended up having to remodel the blood-stained bathroom. And, oh, his father’s suicide attempt just happened to be on V’s birthday to boot. So this time, Gus says he’ll abide by the consensus of his family on whether or not it’s OK for him to end his life. Each member gets a vote. Besides V, there is Gus’s daughter, Empty (Linda Emond), who is a labor attorney who has worked alongside her father in his union and Communist causes (her name derives from the initials of Maria Theresa). Then we have floundering older son Pill (Stephen Spinella), a high school English teacher who’s 30 year in to his graduate school dissertation, which shares its title with the play “The Intelligent Homosexual’s Guide to Capitalism and Socialism with a Key to the Scriptures (in turn drawing its title form works by George Bernard Shaw and Mary Baker Eddy). Finally, there is Gus’ sister, Clio (Brenda Wehle), a former nun who finds wisdom in Eddy’s Christian Scientist writings, who has come home to live in the family’s Brooklyn brownstone (Mark Wendland creates moving sets that quickly become the dining room, Eli’s sad room and Adam’s downstairs apartment). Each is caught up in his or her own problems, which follow them to the gathering. Pill’s partner, Paul (K. Todd Freeman), is upset about Pill’s infidelities and claims of affection for Eli (Michael Esper), a prostitute he found on Craig’s List and on whom Pill has spent $30,000 for sexual favors – a sum he borrowed from Empty. That financial arrangement has angered Empty’s partner, Maeve (Danielle Skraastad), who wanted their nest egg to be used for the baby she is carrying (V provided the sperm). That paternal donation causes friction with V’s wife, Sooze (Hettienne Park) and Empty’s ex, Adam (a very funny Matti Servitto), who happens to live in the home’s basement where he is available for occasional sexual encounters with the ex-wife he still loves. Suddenly, concerns about suicide are clouded by the announcement that Adam has brokered a deal to sell the brownstone for $4.5 million so Gus can provide for his children before he goes, and before the bottom falls out of the real estate market. Before you start thanking God that you’re family isn’t as dysfunctional as you thought it was compared to this group, there’s more. Stopping by with a do-it-yourself suicide kit, complete with detailed instructions for its use, is Shelle (Molly Pierce), the widow of a one of Gus’s union brothers who got the shaft in a deal that eliminated jobs while providing a guaranteed income for Gus. Shelle helped her husband take his life, and now she’s passing on some tips. Kushner is a good storyteller (even if his plots tend toward far-fetched) and creates interesting characters, but he tries our patience with undecipherable cacophonies of conversations taking place simultaneously, supposed theologian Paul’s screaming, preachy, metaphor-heavy monologues and the three-hour-and 40-minute run time. The second act, which could be cut be cut almost entirely, does end with a terrific didn’t-see-it-coming plot twist that changes the minds of anyone plotting an exit during the second intermission, though. In the midst of everything, Gus does manage to have a heart-to-heart with each of his kids and these moments are the highlights of the play itself. Michael Greif’s direction is tight and he gets stellar performances out of most of the actors. Spinella balances sarcasm as a coping mechanism with sheer desperation as Pill can’t give up Paul or Eli. Emond is fascinating as the woman who’s supposed to be in control, but whose life anything but and Wehle is subtly brilliant as the family anchor, trying not to be too horrified by all that’s going on around her. 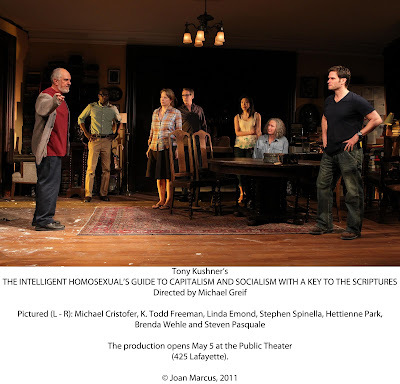 The play runs through June 12 at The Public Theater, 425 Lafayette St., NYC. 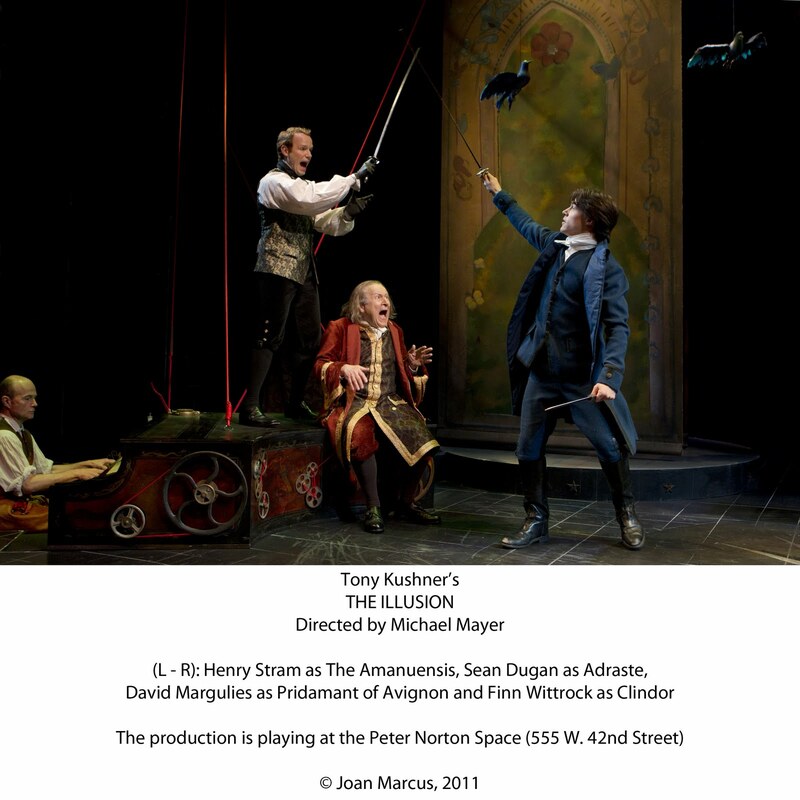 For tickets call 212.244.7529 or visit http://signaturetheatre.org/.